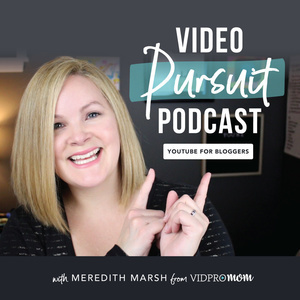 Meredith Marsh from the VidProMom YouTube channel and blog bridges the gap between blogging and YouTube with weekly episodes that help bloggers get serious about video marketing so they can expand their reach and make more money. Discover what’s working right now with YouTube and blogging, including growth strategies, video tips for beginners, search engine optimization methods, content marketing experiments, and good old-fashioned advice from other YouTubers, Bloggers, and Influencers, each who has triggered growth in their online business by embracing video marketing on YouTube, Facebook, Instagram, and Live Streaming. In upcoming episodes, here from YouTubers like Roberto Blake, Amy (Schmittauer) Landino, and Kelsey Brannen (Premiere Gal) plus bloggers like Kara Benz (Boho Berry), Jenny Ingram (Jenny On The Spot), Beth Anne Schwamberger (Brilliant Business Moms), and Jenny Melrose (Influencer Entrepreneurs Podcast). 21: On today's episode we're talking about video editing software for for beginners... this is a topic I have written about about ton, and published videos about, and if video editing software is confusing or overwhelming to you, this is FOR YOU! I participate in various affiliate programs, including Amazon, and I sometimes get a commission through purchases made through my links here.